Quadric Software offers comprehensive business solutions for secure data protection to organizations around the world. Our turnkey backup and recovery solution is flexible, affordable, and easy to use. We help businesses of all sizes, from startups to large corporations. Start a free trial. Protect your business with a comprehensive, efficient, backup solution for virtual and physical environments. With its world-renowned and resilient DR protection, Alike prevents devastating data loss with minimal downtime. Secure your assets with our cloud empowered continuity services, without the need for any additional infrastructure. Manage Your Data Anytime, Anywhere, and from Any Device. In today’s web-driven, virtualized business world, administrators need to have access to their data at all times. 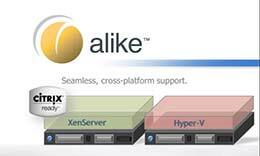 Alike’s web-based management console allows you to manage your data from any computer or mobile device with increased simplicity and speed. At Quadric, we have always designed our solutions with the user’s actual needs in mind, and that’s why our web-friendly UI is easy to use and packed with enterprise features that save time and resources. Intuitive web-based UI allows you to manage your data anywhere, any time, from any device. Amazon S3 cloud connectivity helps you meet the demands of a web-driven business world. Unrivaled, global deduplication saves you storage and money. Changed Block Tracking (CBT) for Citrix XenServer and Microsoft Hyper-V offers faster backups. Simple licensing model scales easily with your organization’s changing needs. Protect an unlimited number of VMs on multiple platforms, all in one install. Hot backups/replication protects any system with no service interruption. Secure, efficient backups ensure complete data protection within your RPO and RTO goals. Our exclusive features, advanced technology, and lightweight footprint allow you to store and recover data securely and affordably. Either edition of Alike also includes 1 year of maintenance and support from our friendly Tech Support Team. Get started with Alike today!